When you do a themed wedding, you have several options, including the level of participation you want from your wedding party and guests. Our wonderful guests were so invested that they almost upstaged us in their enthusiasm (which was the best possible result!) - for example, I know that several (male) guests grew their facial hair fiercely for many months beforehand. Guests, thank you so much for all your effort and investment, we love you guys! A large part of the process, for me especially, was working on the outfits. Although I helped quite a bit with several of the guests' outfits, and of course designed my own, most of my time and focus went into helping our wedding party get their look right. We could have just told them all to wear the same thing, but one of the appeals of Steampunk for me is that everyone can add their own interpretation to the basic concept, and everyone can choose something to suit their shape and personal taste. Once you have the 'longitude' and 'latitude' of your colour, then it's just a matter of intensity. So, you use the 'slider' to select it. So when I set the colour palette, I selected colours with the correct longitude and latitude, and my preferred intensity on the slider, as guidelines, or a general palette from which to work. Unfortunately, as humans all think about things differently, some people took my colour guidelines absolutely literally, and went searching for outfits to match exactly, whereas others almost entirely ignored them, and couldn't understand why I was asking people to avoid, say, fire engine red. It was an interesting experience, but it ended up working out really well. When I started working with the bridesmaids for a general concept for their outfits, I didn't have much of an idea how my own dress would look, because I was trying to keep an open mind in the hope that we would find the perfect outfit on our trip to the USA. Here is a quick sketch that I used to test-drive outfit colours. Of course, this was subject to whatever we were actually able to find. I then worked with each girl to come up with an outfit concept, or persona. I needed these to build the bouquets, too, as I have mentioned, so it was a pretty important part of the process, and it helped us narrow down what each bridesmaid would wear. You will notice that we have one bridesmaid whose costume does not evolve to a paper doll, and another who doesn't have any preliminary sketches. That's because Theresa had some important life changes, and is now walking around Europe with our blessing, while the amazing Nicola came on board towards the end of the process, and ended up becoming indispensable. She graciously agreed to become a bridesmaid after she already had her outfit, so all we did was some tweaking. You will also notice that my niece Roxy is included below - again, her outfit didn't need much sketching because it came together all by itself. George came up with the idea that all of his groomsmen would be slightly inept, which made for a somewhat comical theme in their costumes. Costume Notes: Tools, small notebooks for recording measurements, etc.. I see your character as the only one where less might be more; a few accessories well chosen will probably go farther than strapping the whole toolbox to you. if this were a vaudeville routine you'd be the closest thing to a Straight Man. I'll stop by that tool place and Petone and see if there any any old micrometers and calipers to go with the more wood-focused things. That odd adjustable cresent and screw driver I have might work out as well if presented correctly, though the cresent is a bit bulky? We'll see. Concept: the discount mercenary who carries an arsenal of weaponry that he can't reasonably use. Costume Notes: The opposite of Chris, more is probably more in your case. Lots of weaponry, mostly mismatched. I wasn't sure if you preferred to be more gun or blade focused. The guns would be flash but they're bulky, will require more effort to pull together and you'll need to shed a good portion of them post-ceremony so you can actually sit; if you went blades I have several interesting ones in my collection that would suit and we could make a few more by grinding blades out of some of the timing gears I've picked up (or gear-based ninja throwing stars...). I'll leave the final decision to you though, you have to be comfortable with the look. Concept: Dandy bard equipped with bizarre instruments and makes eyes at the ladies (that last bit is Cat's). Costume Notes: Not ridiculous like one of those walking one man bands but a set of creations that would fit in the woodwind, brass and string categories (no percussion unless you're sure, likely to be noisy and awkward when you don't want it to be). Obviously you don't have to know how to play them, and they don't have to (probably won't) work, but should -look- like they work. You'd be the candidate for the most colour in your outfit, and the most freedom in what you pull together i.e. ability to divert from classical Victorian/Edwardian. Concept: The engineer/alchemist's assistant. Magician's Apprentice, steampunk style; well-meaning but prone to causing chaos. Costume Notes: If he's cool with the concept then we should probably keep it simple; Victorian-esque costume (whatever we can pull together), a blacksmith's apron and a pipe wrench or similar that's WAY TOO BIG for him strapped onto his back in a sheath, like he's carrying it around for the senior engineer. We were originally going to use my fabric designs to make both the waistcoats and the cravats, but we couldn't find the pattern we wanted for sale, and it was going to be exorbitantly expensive. Mindful of our budget, we decided that we would make the cravats and bow ties ourselves - and we did! With George's help cutting out some of the fabric, I made the cravats and bow ties over a couple of nights. I used this excellent guide for the cravats, and extrapolated my own pattern from several of the online bow tie tutorials. Mum liked them in principle, but she wanted a few tweaks. I worked with her to eventually come up with a concept, which we took to our first meeting with Amy of Aeon Dressmaking. After talking with Amy, I refined my drawing further, then went fabric shopping. I got samples of the fabrics I thought would work, and showed them to Mum. To help her visualise how they would look, I mocked them up using my original sketch as a starting point, using photos of the fabric samples to fill in the gaps. Amy did an awesome job of bringing Mum's outfit from concept to fruition, and was so good that I decided to ask her to make my own outfit, too. Here she is in her full glory, and her husband (my stepfather, Nick) even has a matching bow tie! George's gorgeous hat was custom-made by Hills Hats (the hat-band is covered in the leather accessories, below). I made my hat myself, from a variety of ingredients. George kindly helped me make the beaded trim, when our search for something suitable once again turned up nothing usable. For the base, I used a mini cowboy hat from Spotlight. It was the closest I could find in shape and size to what I wanted the hat to look like, so I worked with what I had. For the tentacular 'flower', I used a couple of toys from the discount shops (I think these came from Pete' Emporium). I painted the octopus brown, then rubbed it with the same greeny-gold paint I used for the head table octopus sculpture. I jammed an old clock part into the middle as a central feature. I played the next bit by ear, basically just glueing on more feathers until I thought I had enough, then adding some more. I tied an organza table runner into a bow and let the remainder trail off the back as a veil, like a Victorian riding hat. Before I attached the feature piece, I had to decide on which side I would wear the hat. I tried attaching it in the middle, but I didn't like the effect, so it ended up on (my) right-hand side. I then glued crocodile clips into place so that I could wear it on either side of my head, in case I changed my mind. 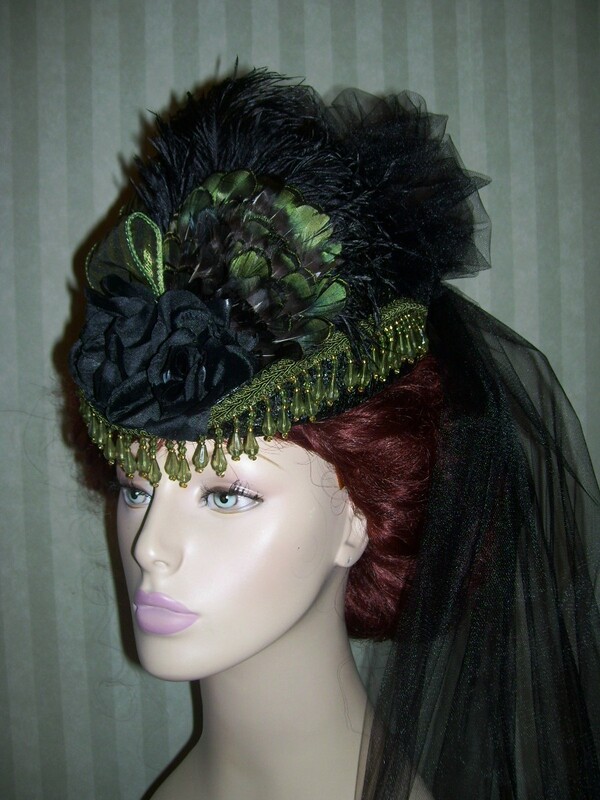 Once I had established the layout of the hat, it was time to design the 'dangles' for the beaded trim. I fell back on my experience working with beads through my hobby costume jewellery business, but it still took a long time to design and assemble. Each one was threaded onto embroidery cotton, and sewn onto a ribbon. I was very grateful for George's help with this fiddly and time-consuming job. All I had to do then was assemble it, and wear it! After spending far too long searching fruitlessly online for the perfect accessories, or the means to make them, we decided to see if we could find someone local to make them. Trevor Lamb of Leather and Art was the one we decided to work with, and it was a good decision - Trevor's experience in costuming for Weta and his interest in Steampunk stood him in good stead as he took my sketches, and inspiration photos, and turned them into exactly what I was after. Here are a couple of my inspiration photos. ​For my ceremony outfit, Trevor made the belt, belt loops, and cell phone pouch, which I then transferred to the harness belt that I wore for my reception outfit. For George's outfit, Trevor made a hat-band to fit the little jars we found at Uncle Bill's, loops for his belt, and two holders, one for George's cut-throat razors, and one for the collection of vintage vials and syringes. So that Trevor could size them exactly, George provided wooden blanks that matched their sizes and shape. As we've covered, George's hat was custom-made by Hills Hats of Petone, Wellington, and his leather accessories were made by Trevor of Leather and Art. The small vials on the hat band were sourced from Uncle Bill's. The belt is an authentic WWI belt from Hanley Soloway, right here in Wellington. The cut-throat razors were from George's own collection of interesting blades, from which he also equipped Kiel's mercenary outfit. The sphygmomanometer and the vintage green-lensed glasses were from Steampunk Works in NJ, and the vintage syringes came from Loved to Death in San Francisco. We were lucky enough to be able to take an extended 5-week road-trip holiday across the USA in March 2015, so we took advantage of the opportunity to get accessories and Steampunk clothing that you can't get in NZ. While we were in San Francisco, we both tried on the excellent range of Steampunk clothing available at Distractions on Haight, and George was able to purchase several items, so he knew exactly which things would fit him when he went to order them online. George is wearing his own boots, and the cravat, tie pin, lapel pin and rabbit kilt pin were made by me. The kilt pins were a pair that I assembled for us, so that we had something small that matched (see 'Something new' below). The jacket, shirt, waistcoat, and trousers were all from the Historical Emporium website. For as long as I can remember, I have known that I didn't want to get married in white. I remember designing dresses in champagne, silver, even thinking about purples and burgundies. Halle Berry's 2005 Oscars dress was one of my particular favourites, for example, but even then, when I was slimmer, I still didn't think it would quite be right for me. By the time I met George, I had been thinking about what styles fit different shapes for years - I had been through two major weight losses, and sadly, three major weight gains, so I knew that I wasn't going to be wearing a Halle Berry dress. When we decided on our Steampunk theme, the various sizes and shapes of the wedding party and guests were also a factor - we didn't want to choose something that would make any group look better than any other, but of course the most important thing was that it would suit (and flatter) us. Once we had decided on the theme, I began making sketches and gathering ideas. As I discussed in the Bridesmaids' section, above, I started by looking at the overall colours of our outfits, then moved from there to the details. I wanted a long dress, but I wanted a removable skirt, so that I could be comfortable for the rest of the evening. Eventually, I decided that I would have two outfits, one for the ceremony and one for the reception. This choice gave me the freedom to build my ceremony dress around the corset that I had found, but then design a whole new outfit for the reception. Here are some of my initial sketches, cobbled together during conversations with Amy from Aeon Dressmaking. One of the most exciting parts of the process was when all the fabrics arrived! As well as generic fabrics from Fabric.com, and my own designs (reception blouse and cravats) from Spoonflower.com, I also used amazing book fabric and a William Morris print, designed by Peacoquette Designs. You can see them peeking out from the pile above, and mocked up in my fitting comparison pic, below. I was really excited and looking forward to pulling the outfit together around the amazing-looking Engineer Corset Belt by Harlots and Angels. Unfortunately, there were two issues with it - one, in the photos available at the time, it wasn't clear that there were huge sections of elastic on each side, or that the straps that appear to be attached to the corset are actually part of something else. The second issue was worse, for me, because it was embarrassing - the corset is really well made, but it's made for a smaller person. When she made me a 'plus size' version, she only lengthened the elastic, without increasing the size of the side panels. It was awful - I looked like I had squeezed myself into something that was too small for me, rather than spending several months chasing down a custom commission. When the corset arrived, I was so excited that the pièce de résistance had finally arrived, and the front panel was so perfect, I was even more gutted when it didn't fit. As you can see from the sketches below, I had planned my entire ceremony outfit around this corset, so I was suddenly almost in September, with no corset, and just under two months to my wedding. A few days before the corset belt arrived, I stumbled across the Facebook page of Rétrofolie, and mooned over the beautiful Mucha corsets like this one, but didn't think about it any further, because they were so expensive, and I already had a corset on the way. When we decided that I simply couldn't wear the corset belt (it didn't even sit properly - too much elastic meant that it squeezed me unflatteringly, and the elastic actually curled and flipped, too), I thought I might as well approach them and see if they could do it. Julianne was amazing! She got it done fast and well, using my preferred images, and in almost no time at all, I had a perfectly-fitted, hand-tailored, amazingly gorgeous corset. The hunt for wedding shoes was a mission, because my left foot is an entire shoe size smaller than my right foot. I was lucky enough to be able to design my very own shoes as a birthday present from my husband-to-be and my Mum, so I got these beautiful, custom shoes from Shoes of Prey. You can order your own pair here - you can customise my design to suit your needs, or just use it as inspiration to make your very own from scratch. I designed my reception outfit to be lighter and more comfortable, so that I could move around more easily. It's quite amazing how Amy from Aeon Dressmaking managed to take a few sketches and some inspiration photos, and turn it into exactly what I wanted. We didn't really follow many traditions in this wedding. George and I are both atheists, so there was no need for a church, and we lived together for just over a year before the wedding. I did go and stay at the hotel on my own the night before, though, and George stayed home with the pets and his groomsman Ciaran for company. The other tradition I chose to follow was the "something old, something new, something borrowed, and something blue" rhyme. Well, apart from my dress, the leather accessories, the veil, the shoes, the leggings, even the underwear... I decided that my 'something new' needed to be something special, that would tie me to George just quietly while I was nervously getting ready. As I have mentioned, George likes rabbits (and hares) - his skateboard-making business is named for them, using the Latin word for hare, Lepus. So, for our special 'something new', I found us matching rabbit (or are they hares?) kilt pins, and added a vintage cameo joiner and an octopus dangle, which tied us into the wider wedding group - everyone had something with an octopus on it, made by me under my jewellery and artwork label, Phersu Dancing Designs. The hardest thing for me to find was something to borrow that I would feel happy to wear on me, not worry about losing, and would have enough meaning to be worth adding to my (already crowded) outfit. Luckily, my Mum came to the rescue with a lovely handmade brooch that I had given her several years ago. It was made by Smash Palace Jewellery from an old piece of broken crockery, which appeals to me anyway, but even better, it featured Mum's mother's maiden name, Sutherland. And it was white and blue, so that was an additional bonus for the 'blue' category! best of all, it suited the style of my dress, and it pinned on securely! Well, if we allow that the turquoise used throughout my outfit is a turquoise blue, rather than a turquoise green (and it is), then both blouses qualify, as does the brooch my mother lent me. I decided to choose my veil as the specific 'blue' thing, though, as it was the most intrinsically 'weddingy' thing in the outfit. And that's it! That's the whole outfits post! You're welcome. The creative artist and the practical engineer - a perfect marriage. And this is how we did it!